A great soap for dark and discolored skin. Target problem spots and combat hyperpigmentation with this special intense whitening soap that combines a bleaching formula with glutathione. Have smooth and fair skin that glows. I was checking out the available whitening soaps in Watsons and oh-well my mind was going in circles when I landed on a decision to purchase Active White Bleaching Soap. Did I made a right decision? Read on to find out. Seriously, you can't get much info from the website of ActiveWhite here. Based from my research they have just changed their packaging, what I have posted above is the latest since it was just manufactured fresh from this month, Dec 2013 and expiration is far on Dec 2015. The old packaging indicates that it contains L-glutathione which is the selling point of the product. There are not much reviews on the web for ActiveWhite, I already bought the product even before I've read details about it. I was just brave enough to venture out on using a product I was unfamiliar with. I find the marbled look of this soap interesting. (Photo above) I don't know if they have this is other sizes but they currently offer three variants. All of them has the same ingredients except for their special content which differs them from each other: Beta carotene (Blue box - ActiveWhite Bleaching Soap), Rosehip (Orange box - ActiveWhite Rosehip Soap), Plain Glutathione (ActiveWhite Pink box - Glutathione Soap). It has a really faint scent which can be next to nothing. It is perfectly okay with me though, I do prefer unscented beauty products. At first I thought ActiveWhite Bleaching Soap is moisturizing because it is bubbly and it doesn't sting during the first 3 days that I have used it. Truth has to be revealed though, it is still a bleaching soap. I just suddenly experienced itchiness while I was in the office. I found my skin to have some bumps due to dryness, yikes! My skin showed the same reaction when I used bleaching lotion from BCP before. I can't help but become worried if I should continue or stop the usage of the product. My skin was next to being okay before I have used this soap and I kinda regret using it. Within 7 days my skin was micropeeling. Of course just like any bleaching product, skin became a bit darker than its normal color and somehow glossy (sign that skin will peel). It is continuously micro peeling but after a week, I felt like my skin has adjusted to the product. I refrain from using lotion though because I don't think it is fine to use two products at a time. I only apply hydrocortisone cream when my skin is itchy, err... sometimes Katinko because I like it as an itch-reliever too. Melts fast. Two weeks for a 135 g product. Did I whiten? It melted even before I can make a valid conclusion, however since my skin is already well-exfoliated then I think whitening products will be more effective. ActiveWhite Bleaching Soap is not for me. But what doesn't work on me does not mean won't work on you, and vice versa. Always remember to stop usage if you experienced severe dryness/rashes. I can see that you've already tried a lot of whitening products. Which of it would you recommend for sensitive skin? I thought I am the only one who experienced itchiness from this product. 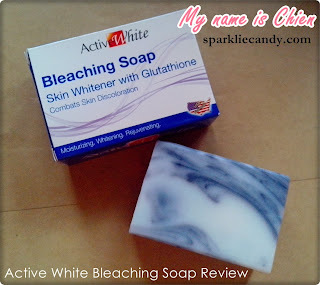 I tested ActiveWhite Bleaching Soap on one of my arms and observed if irritation will occur. After several days of testing, I decided to use this product on my whole body because there is no irritation that occurred when I tested it. Just after 3 days, my whole body felt sooo itchy. I had rashes on my whole body which made me ask my sister-in-law to buy Calamine at Watsons (I cant go out because people might see my rashes). I did scalding almost the whole body with hot water (temperature that my skin can endure) to relieve itchiness so I can avoid scratching my skin. I also take anti-histamine to help me with this allergic reaction. My experience was extremely terrible. I regret using this product. I am not saying that everyone will experience the same but this product is not for me.